SUPPORTING THE PRESENT, ENSURING THE FUTURE. When Barbara Jungmann, a registered nurse, moved from Vancouver to Canmore in 1985, she expected to learn a little bit of everything. That, it turned out, wasn’t exactly the case. “You actually do have to have quite a vast knowledge about everything,” said Jungmann, who has worked as a nurse in the Bow Valley for more than three decades. Though patients often get referred to specialists in Calgary, the Canmore General Hospital has consistently improved its services through expansions and equipment purchases courtesy of the Canmore and Area Health Care Foundation. One of these items is a bedside ultrasound, which Jungmann has found to be an invaluable piece of equipment with many uses. “It’s an amazing adjunct to the emergency department,” said Jungmann of the bedside ultrasound machine, which can detect things the regular ultrasound machine cannot. For example, if a woman early on in a pregnancy were to come in unable to find her child’s heartbeat, this machine would be able to help detect her baby and see if there is a heartbeat. For Jungmann, whether the news is good or bad, the value of this additional service is being able to give a patient an answer more quickly. Jungmann trained at the school of nursing at the Vancouver General Hospital, where she worked in the intensive care unit areas. She did not predict what rewards working in a small community would give her. Starting at the Canmore General Hospital, Jungmann said it was a vastly different experience, and the learning curve started immediately. She has worked in the long-term care facility (the Golden Eagle View), the emergency department, operating room, as well as the labour and delivery room. Being a nurse in a small community, rather than a big city, the role extends beyond the hospital walls. She started to get to know the people who came into the hospital, but likewise, they began to remember her, too. A trip to the grocery store or a walk at the park could open up conservations with patients or their family. “You are part of the most joyous experiences often in a person’s life which would be the delivery of their children,” said Jungmann. Sometimes, the impromptu run-in is with a woman whose baby you helped deliver, recognizing their infant who’s now a toddler. Other times, the encounters are more solemn. You’re “part of the hardest experiences of the people in this community which would be maybe the death of their loved ones and their spouses,” said Jungmann. At the heart of all the encounters, though, is a sense of connection that comes out of sharing the same small community. “In this town when you hear an ambulance or when you hear a fire truck, it means something to you,” said Jungmann. While the hospital is located in Canmore, it actually serves a much larger group of people. Some people coming from as far as Cochrane or Calgary, citing quality and efficiency of care as their reasons for making a longer drive. Jungmann and the other nurses have also made consistent outreach to the Morley community. Twenty per cent of inpatients and a third of outpatients from the Stoney Nation, the nursing staff makes a continued effort to visit the community “to provide the best, culturally sensitive service that we can here,” said Jungmann. With a growing Bow Valley community of retirees, young families, seasonal workers and more, Jungmann said the hospital gets a steady stream of thank you letters and cards from patients or their families, grateful for the quality of services the Canmore General Hospital provided them. ER Nurse, Barb Jungmann (second from left, wearing red), has worked in the Bow Valley for more than three decades. Her fellow nurses, doctors and other staff at the Canmore General Hospital contribute to the sense of community unique to working in a small centre. 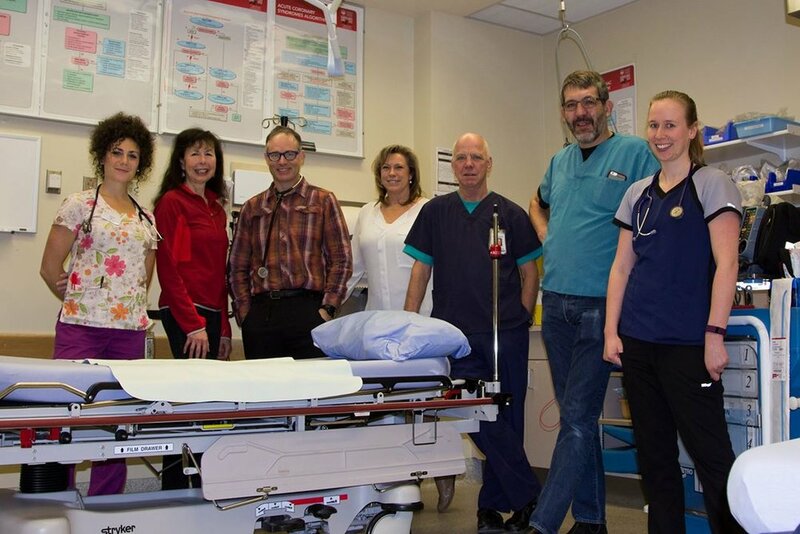 Barb Jungmann pictured with some of the Canmore General Hospital's ER staff, where quality, community care starts. From left to right: Chris Allen, Charge RN, AC Barb Jungmann, Charge RN, ER, Dr Gert DuPlessis, Rachel Stefaroi, Unit Clerk, Dr Jim Hendry. Seated: Jenna Power, RN, Kat McLaren, RN.